Everyone's favorite neighborhood pool guy is back in action in Phunny plush form with a magical sidekick Unicorn along for the ride. 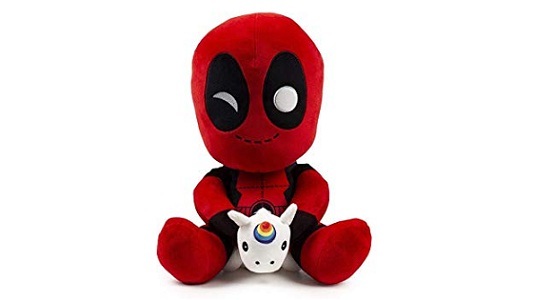 Just in time for the new Marvel Deadpool 2 movie, this Deadpool plush will ride his rainbow unicorn pal right into your hearts. Its a fantastic Marvel Deadpool Riding Unicorn Plush from Kidrobot. The Merc with a Mouth looks a happy as can be riding the little unicorn with a beautiful rainbow colored horn. A superb addition to Kidrobot's PHUNNY line of squeezable plushes, this 8" Deadpool plush features their legendary quality of toys.